With summer in full swing it’s high time to get back to my macro roots. In the front yard fresh daisies are in bloom affording the perfect opportunity to return to some good old fashion handheld camera fun. 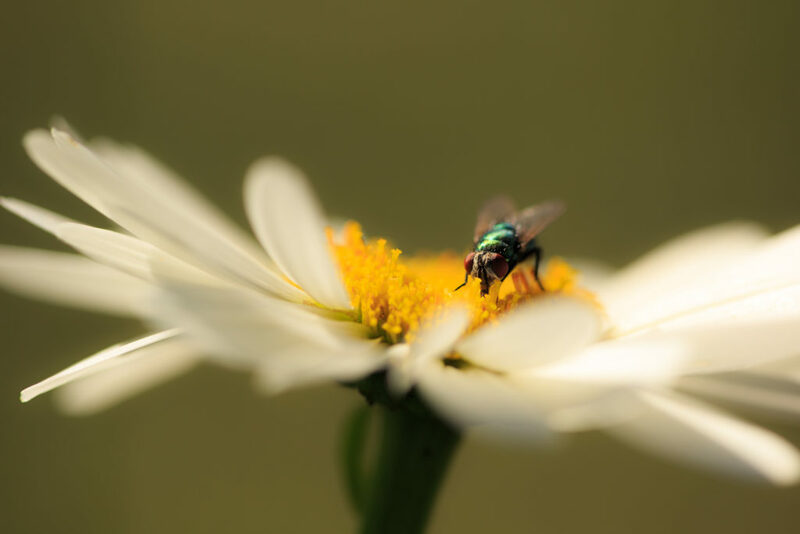 Macro work is a chance to get back to basics—a chance to ditch the tripod, ditch the bracketing, ditch the timer, ditch the routine to make some old school point and click shots. The other day a blue bottle fly came to visit, pollinating away on the fresh blossoms. Not easily scared the fly was more than willing to let me get up close and personal with my 100mm lens; these shots were made at a distance of roughly 12 inches from my subject—allowing me to bring the viewer right into the frame. Now I have to admit, shooting macro far less frequently these days I’m a little rusty, but I still made off with a few decent exposures. Practice, yo—I hear it makes perfect. More to come.